At the start of a battle, one or more tank silhouette tokens are placed on a deployed tank model to indicate the relative strength, number of hits, the tank can absorb before being lost. see Tank Specifications rules section Tank Strength. When a tank is being attacked in combat, each burst symbol is rerolled to confirm the hit against the tank. Each Deadly Die side symbol, that scores a hit under normal combat circumstances, is also rerolled to confirm the hit. All dice are rerolled together once. A machine gun unit rolls three dice in ranged combat against a tank. The roll is 1 soldier, 1 Deadly Die side and 1 burst. Only the burst die is rerolled to confirm the hit on the tank, because a machine gun unit does not hit on a Deadly Die side rolls in range combat and therefore is not rerolled. An infantry unit, with a bomber figure, is attacking a tank in ranged combat from two hexes away. The roll is 1 soldier, 1 Deadly Die side and 1 burst. The burst and Deadly Die side dice are rerolled to confirm the hit on the tank because an infantry unit, with a bomber figure in ranged combat from two hexes, will hit on a Deadly Die side roll. A reserve artillery On Target combat roll against a tank is 1 soldier, 1 Deadly Die side. The Deadly Die side die is rerolled to confirm the hit on the tank because a Deadly Die side die roll scores a hit when reserve artillery is On Target. On the reroll, a burst symbol will confirm a hit and one tank silhouette token is removed from the tank for each confirmed hit. When all tokens have been removed from the tank, the next confirmed hit will remove the tank model and the opponent will gain the tank Victory value in medals for eliminating the tank: see Tank Specifications rules section Victory Value. Do not collect HQ tokens on the reroll to confirm tank hits. A tank on a terrain hex will not receive any terrain protection. A tank will always ignore the first flag rolled against it. A tank will never retreat when a flag is rolled on it in combat. Flags that cannot be ignored are treated as a potential hit that must be confirmed. Roll one die for each flag that cannot be ignored along with any other hits that must be confirmed, when rolling to confirm hits on a tank. When two flags are rolled against a tank, one flag must be ignored and the second flag will add one die when rolling to confirm hits on the tank. When reserve artillery targeting dice creates a shell crater in a hex with a tank, by rule all dice symbols will count. In this case it will override the tank’s ability to ignore one flag. A WWI tank when moving was often prone to bogging down or even breaking down, and could be something as simple as the engine needed to be restarted. In either case, bogging or breaking down, would prevent a tank from moving any further until the situation could be remedied. When a tank is bogged down, it may not move. A player must roll 1 die to see if a tank will bog down when a tank moves 1 or more hexes. Basically an early war WWI tank, that only moves one hex, will make a bogged down roll for the first hex it moves onto. 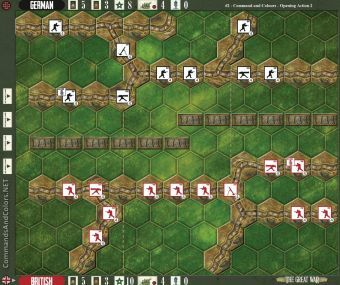 A later war tank, that moves two or more hexes, will not make a bogged down roll for the first hex it moves onto, but will roll 1 die for the second hex and third hex it moves onto: see Tank Specifications rules section Movement. A player must roll 1 die to see if the tank will bog down when a tank is taking ground and moves onto the vacant hex after a successful close combat. 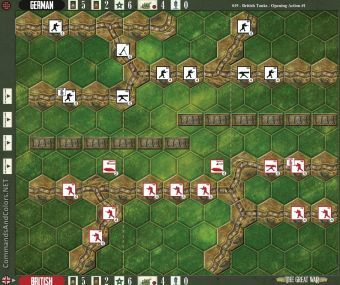 A player must roll 1 die to see if a tank will bog down when a tank moves onto a hex with terrain. Terrain that requires a bogged down roll are: forest, building, building rubble, trench, shell crater, mine crater and a hex with a fortified position token. A wire token itself will not require a tank to make a bogged down roll. A player does not need to roll when a tank moves onto a trench hex that is part of its own friendly trench line. Key Rule - The number of dice a player must roll to see if the tank will bog down is cumulative. When making a bogged down roll, a tank will bog down when one or more Deadly Die side symbols are rolled. A bogged down marker is placed on a hex with a tank. A tank when moving and it becomes bogged down may not battle during the battle phase. A tank when gaining ground and it becomes bogged down will not gain a bonus combat. An ordered Mark IV tank has moved one hex and is moving onto a second hex. A player will make a bogged down roll with 1 dice, 1 die because it is the second hex of movement for the tank. An ordered Mark IV tank has moved one hex and on its second movement is moving onto a hex with a trench. A player will make a bogged down roll with 2 dice, 1 die because it is the second hex of movement and 1 die for moving onto a trench terrain hex. An ordered Mark IV tank has not moved this turn and is battling in close combat against an infantry unit on a countryside hex. The close combat is successful. The Mark IV tank must gain ground. A player will make a bogged down roll with 1 die, 1 die because the tank is taking ground after a successful close combat. An ordered Mark IV tank has not moved this turn and is battling in close combat against an infantry unit on a shell crater hex. The close combat is successful. The Mark IV tank must gain ground. A player will make a bogged down roll with 2 dice, 1 die because the tank is taking ground after a successful close combat and 1 die for moving onto a shell crater. To recover a bogged down tank, the tank must be ordered. When ordered, the player may gain 0, 1 or 2 recovery dice, based on the tank, to roll to return the tank back to normal status: see Tank Specifications rule section Recover. In addition to dice gained when ordering the tank, a maximum of three additional recovery dice, can be rolled by spending HQ tokens. One additional die is rolled for each HQ token spent. All dice are rolled at the same time and the Tank recovers and is back to normal status when one or more HQ symbols are rolled. Remove the bogged down marker and the tank may move and/or combat this turn. HQ tokens are not collected when rolling to remove a bogged down marker. If no HQ symbols are rolled, the tank remains bogged down. The tank may still battle this turn, but the tank’s combat dice are reduced by 1. After a player makes an unsuccessful roll to recover a bogged down tank, the player may choose to ditch the tank. The bogged down marker is flipped over to the Ditched Tank side. A ditch tank may not, move, battle or attempt to recover. The same procedures are used when targeting and confirming hits on a tank with a ditched tank marker as a tank with a bogged down marker. The main reason a player may choose to ditch a tank, is that a tank with a ditched marker is only worth 1 Victory Medal when eliminated by your opponent.